What a difference 24 hours makes as the New York Ranger and New York Islander prospects go from solid performance after solid performance on Friday to not a single star on Saturday night. In many ways it was a disappointing evening as this is February 1 and the last day of the CHL and NCAA regular season will be here sooner than you think. While some prospects already know their fate (as to whether or not they will be signed) there are those who are still trying to earn their professional contracts. 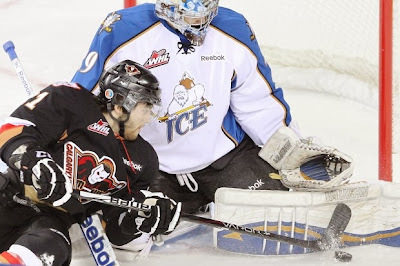 Mackenzie Skapski (NYR 2013 6th) and his Kootenay Ice were facing Adam Tambellini (NYR 2013 3rd) and his Calgary Hitmen in a key WHL game for both teams. The Ice who despite winning 7 out of their last 10 just can't seem to move up in the WHL's standings while Calgary is starting to watch the Edmonton Oil Kings pull away and walk away with the WHL's Eastern Conference title. This one was a tad on the strange side as it featured 3 different empty net goals as Kootenay pulled away from Calgary in the 3rd period for a 5-2 win. The game's first goal was one you don't see everyday as while Calgary was in the process of getting called for a penalty and Skapski off for an extra attacker, the Ice wound up putting the puck in their own net to give Calgary a 1-0 lead. Not even 10 seconds later Calgary would score a shorthanded goal to make it 2-0 and it was not looking like the Ice were in good shape. The first period would end with Calgary up 2-0 but the 2nd period would be a different story as Kootenay would rally for 2 goals and force a tie game after 2 periods. In the 3rd period it was Calgary's turn to have the strange stuff happening to them as Kootenay would score the go ahead goal just over a minute into the 3rd period. Calgary though would wind up taking 6 straight penalties during the period including one player who found himself called for 3 separate minors which Calgary was able to kill off. Kootenay would finish off the game with 2 empty net goals for the 5-2 win and move up into 7th place in the WHL's Eastern Conference standings. Skapski would stop 20 out of the 21 shots he faced in earning his 6th straight win which is a new career high for him. Skapski is now 17-13-2-1 with a 2.79 goals against and a 0.915 save percentage. Adam Tambellini was scoreless and a -3 for the night as Calgary falls 5 points behind Edmonton in the race for 1st place in the WHL's Eastern Conference. Kootenay may be in 7th place but they have closed to within 4 points of 4th placed Medicine Hat. That is because Griffin Reinhart (NYI 2012 1st) and his Edmonton Oil Kings were handing the Medicine Hat Tigers a 5-1 loss. Reinhart was scoreless and a +1 as the Oil Kings blanked the Tigers on all 4 of their power play chances. Edmonton has won 8 straight games and is starting to pull away from the rest of the WHL's Eastern Conference. Kyle Burroughs (NYI 2013 7th) scored a goal while also being a +2 while taking 2 minors for hooking in the first period to lead his Regina Pats to a 5-2 win over the Moose Jaw Warriors. It was Burrough's 5th goal of the season tying his career set last season and it was also Burrough's 31st point of the season. Regina has won 2 straight and while they are in 6th place in the WHL's Eastern Conference, the Pats are also just 1 point behind the Brandon Wheat Kings who lead the WHL's East Division and currently sit in the 2nd seed for the WHL's Eastern Conference. Ryan Pulock (NYI 2013 1st) and his Brandon Wheat Kings hold that one point lead over Regina thanks to defeating the Saskatoon Blades 4-1. Pulock was scoreless as Brandon is part of a 3 team race for the WHL's East Division and the 2nd seed that comes with it. Victor Crus Rydberg (NYI 2013 5th) set up Ryan Hartman's power play goal in the 3rd period that tied the score at 3-3 as his Plymouth Whalers rallied for a 4-3 win over the Belleville Bulls. The assist was Crus Rydberg's first point in 7 games and was his 21st assist on the season (6-21-27) as Plymouth won for just the 3rd time in their last 10 games. Jesse Graham (NYI 2012 6th) had a assist on the game tying goal as his Saginaw Spirit rallied from down 0-2 to earn a 4-2 win over the Kingston Frontenacs. Graham had a secondary assist for his 30th assist of the season and his 40th overall point. Adam Pelech (NYI 2012 3rd) and teammate Troy Donnay (NYR 2013 UFA) were both held scoreless as their Erie Otters lost to the Owen Sound Attack 2-1. The loss snapped the Otter's 4 game winning streak. Loic Leduc (NYI 2012 4th) had an assist to go along with 3 hits but it was not enough as his Rimouski Oceanic dropped a 6-4 decision to the Shawinigan Cataractes. This one the Oceanic should be angry at themselves for allowing the worst team in the QMJHL to hand them a loss when the Oceanic is looking to make a playoff push. Got to like the new look Leduc as his defensive play has picked up and he is using that big body of his more. Leduc is also now 4-7-11 on the season. Brady Skjei (NYR 2012 1st), Jake Bischoff (NYI 2012 7th) and Taylor Cammarata (NYI 2013 3rd) were all scoreless as their top ranked Minnesota Golden Gophers shutout the Michigan State Spartans 1-0. Very solid defensive effort out of the Gophers who never let the Spartans register double digits in shots in any of the 3 periods holding them to just 19 shots total. Cristoval Nieves (NYR 2012 2nd) was scoreless on just 1 shot and a -1 as his 12th ranked Michigan Wolverines went to an overtime tie with the 9th ranked Wisconsin Badgers 2-2 (Michigan won the shootout round 1-0). Steven Fogarty (NYR 2011 3rd) and his 14th ranked Notre Dame Fighting Irish will most likely be exiting the rankings after losing to New Hampshire 5-2 and being swept in the 2 game series. Fogarty was scoreless on 4 shots as he has been elevated to 2nd line center. Goalies Eamon McAdam (NYI 2013 3rd) and Stephon Williams (NYI 2013 4th) were both used as backups on Saturday night.